One down, nine to go. | Fat girl gone RAW! Today was not as challenging as I was expecting. My biggest setback (if you can even call it that) was that I injured myself over the weekend, and had a lot of shoulder and neck pain today. I tried not to get too bummed out about this, but I will admit, being in pain all day did take away some of my positive energy. Thankfully, I am feeling a little better tonight, and excited about some of my recipes for tomorrow. 1) Chopped off all my hair…and feel great! 2) Spent a lot of time outside, even laid in the grass for awhile and watched the clouds. 3) Followed through with my goals. 4) Listened to my body and took it easy when I felt like I should. 5) Made a delicious raw soup for dinner and enjoyed it with my husband. 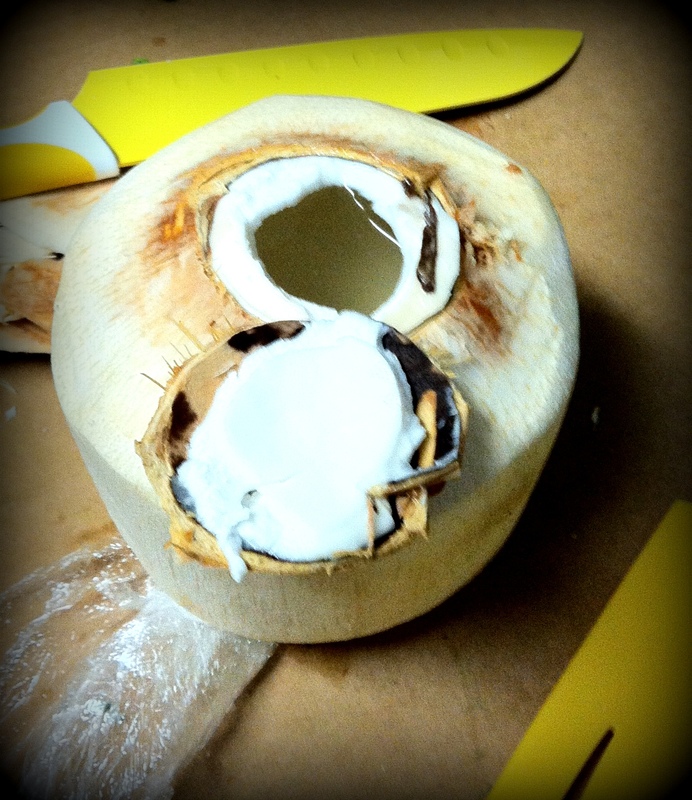 6) Opened a fresh coconut, drank the water and tasted the meat! My first ever fresh coconut experience, and it was so cool. 🙂 Much easier than I expected. Going to make a beautiful tropical smoothie in the morning with the water, meat and fresh pineapple! 7) Did not feel super hungry today, but I know that I did not get enough juice or smoothies in me. Tomorrow, I’m stepping it up a notch! 1) Prepare for meals, make a list ahead of time so that I don’t feel overwhelmed when it’s time to get the juice going. 2) Devote more time to Yoga and take a bike ride on my own. 3) Take a soothing bath with the lovely salts I bought! « The night before the 10-day juice feast….gearing up!